I'm going to try this Manisha! Although I cook often, I don’t enjoy it and I rarely get inspired to try something new. I'm going to take your suggestion and switch off from my other chores and do this. I did not know that rice stops cooking after sugar goes in. Great tip that one! Manisha, Stop! Please! This is torture! The payasam looks soooo good. 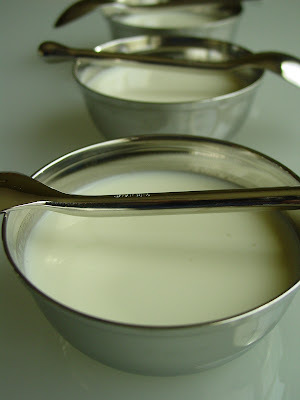 I saw that milk pic in your flickr account, but didn't know you were making payasam. Payasams are my favorite but I never thought you would be dishing out paal payasam of all the things. You have totally impressed me,friend. 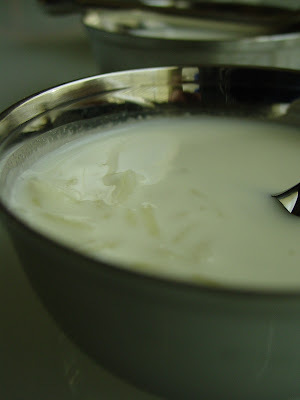 This is a recipe I have never made as it usually a Hindu tradition to make paal payasam. Thanks so much for the recipe. I am definitely getting this book. You have convinced me. B-E-A-U-T-I-F-U-L! Was nodding my head at the whole meditation bit...and minimalistic is truly wonderful here...my mom/granny/aunts make pal payasam with only 3 ingredients, milk, rice and sugar and it is divine...your post makes me wanna STIR STIR AND STIR some more...you are on a Kerala roll girl :) Hugs! Nice write up and delicious looking pics!! I love Pal payasam. will come back for more recipes. No hugs from me..I am sulking..
Much is made of rice in K- Kashmir! OMG Manisha....this is my most favorite sweet everrrrr and the keralites and Tams are the best cooks to make it. We are a Telugu-Tamil mix and any time I went to a Tamil function I would wait eagerly for the dessert to be served. Warm paal payasam on a fresh banana leaf...Heaven. The payasam looks yummy. Also a very good write up. Makes me want to make payasam tonite, although I promised myself that I will not make a dessert till the weekend. Shilpa, it is so hard to believe that you don't enjoy the process of cooking when you are such a great cook! Those aren't mere words as I have tasted some of the yummies you've cooked! I don't care much for the clean-up and my assistant quit a couple of years ago, given how may pots and pans there are on a daily basis - so that part of it remains a chore. But I enjoy cooking. I find it very therapeutic and relaxing. RP, I've been cooking from Ammini's book since November as I prepared for a cook together I hosted in December last year. Ammini was very kind and gracious with recipes from her book as well as with her patient advice to this novice in the world of Kerala cuisine. There is so much learning in Ammini's book that I am sure you will bond with it right away! Like you, Ammini shares her knowledge selflessly. Mandira, that sounds very interesting. I generally don't associate the word Kadi with anything sweet. You must get the recipe from your m-i-l! Gini, there are very few Indian sweets and desserts that I enjoy. 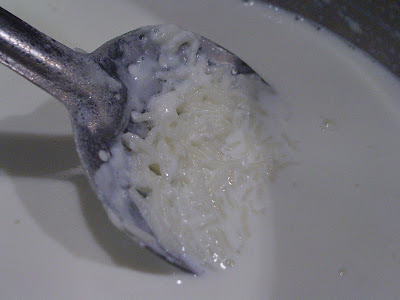 I don't like kheer much, especially those pieces of malai floating about in the milk. They get stuck in my throat and make me want to throw up. Kheer in its restaurant avatar here is simply avoidable. This paal paayasam, on the other hand, is delectable and no floaters! Yes, it's rich and high in calories. But everything in moderation is just fine, right?! There is so much about Kerala that I am learning through Ammini's book. My cousin is married to a Syrian Christian and we have very close family friends who were Malyali in Nairobi so while I was aware of the rich culture of Kerala, I just never paid attention. Ammini's vegetarian dishes are putting so much life back into the daily fare in our home. And your fish curry was another excellent example of "so much flavor, with such few ingredients." Remember that there are no glossy pictures. The book rides totally on Ammini's skillful writing. I keep calling it the definitive "Joy of Cooking" for vegetarian food from Kerala. (JoC has no pictures; just some illustrations interspersed here and there) And, go ahead and make the paal paayasam - it is so fulfilling! Nandita, I am so glad it struck a chord with you! I am totally on a Kerala high. So much so that I want to go there on my next visit to India, whenever that is! Sharmi, thanks and welcome to IFR! Your mango pulihara sounds like something I may make next, especially since I have a raw mango in my fridge! Yummy! Oh, Ms Tikoo! I need those hugs, you know. As for stealing your thunder, uh-uh! Big huge uh-uh! I am sure there is a Kashmiri Pandit spin to rice and milk. I think rice and milk is pretty universal. Kheer and paayasams, though seem to have been perfected by South Indian cuisines. Kheer in our family was not a pleasant experience. We started eating it only after my mother took careful instructions from a Tamilian neighbor. She brought the milk to boil in a pressure cooker and it always had a pinkish hue without being cooked forever. I don't think she wrote it down anywhere. I'm going to have to get it from my aunt. But in all honesty, it pales in comparison to this creamy paal paayasam! Will send you instructions by email on how to use hyperlinks. Priya, that is exactly how Ammini describes how paal paayasam is served and eaten: on a fresh banana leaf. There are several other paayasams in the book, some have ginger and cardamom, some are served with honey and ghee, some have nuts, some have coconut milk and so on! But not this one. Ammini suggests, too. She says the paayasam gets that much wanted pinkish color. I will update my post with that additional information. And you know what? I, too, prefer it warm! You are right, it is heaven! Deepz, don't make this in a hurry. Make the time and enjoy the process. You are sure to enjoy the results! I got your email - thanks for all that info! Will reply soon! Ohh Manisha, I looove such long and time consuming recipes. I love to try them once in a while :). Thanks for posting this. Looks like my hubbby will love this. You know what? I clicked the comment link of this post and was wodering when I left a comment, since I am 100% sure I am reading this post for the first time :). Then realised it is the other Shilpa :). Uh Uh Manisha. Sorry for the confusion.This is the other Shilpa! Make this paal paayasam and tell me what you think. I am planning on making it often but giving it away each time I make it. Several of my neighbors will be very happy! And I will reap the benefits, too! btw, not arguing with ammini here, but another reason traditonal paal payasam in kerala is pink is because of the rose matta rice or kuthari. it gives it a pinkinsh tinge and makes it creamier. Show me the way and I will be there. What will I get as fair exchange for stirring? Bee, I don't have any experience with rose matta or kuthari rice. What about these grains lends itself to making paayasams creamy? 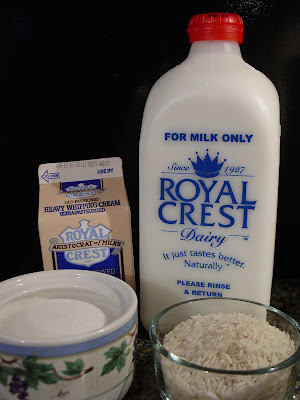 I remember reading about rose matta rice on Indira's blog, made a mental note to try it out sometime but haven't done anything about it as yet. My mother used 'tukda basmati' when she made kheer and it turned pink on boiling at high temperature in the pressure cooker or at least that is the reason I think it turned that color. I need to call my aunt this weekend to find out the whys of that recipe! Bee: I have mentioned in the recipe back home, hand-pounded unakkalari, the aristocrat of rice varieties, is used for making paayasam. I didn't use the word kuthari; instead used the words hand pounded. Also I wanted stress that the rice for paayasam should not be parboiled. That is why I wrote hand pounded unakkalari. Wow, Manisha, I'm not a fan of the long, slow, stir-for-hours school of cooking, but you make it sound so VERY appealing!!! :) Very nice post! Ammini, thank you very much for that explanation! I now understand that kuthari and hand pounded unakkalari mean pretty much the same thing. And that the rice has "just the right cling" which "depends on the starchiness of the rice" without the end result being gummy. This is where the creaminess comes from. To confirm whether the pinkish color comes from the rice or the caramelization of milk sugars (primarily lactose), I guess that can be determined by making paal paayasam the old-fashioned way but with long-grained white rice. :-D Any volunteers? Shyam, it made me feel good! What can I tell you! And I made it more than once. I am now looking forward to making gajjar halwa the slow-cooked way. so there are two varieties of rose matta rice? parboiled and on-parboiled? i didn't kno that. i've always seen and used the parboiled one. manisha, the parboiled one is super starchy, like arborio. I bought whole milk and cream today. Will get ready to stir tomorrow. I agree you make it all sound so appealing that I (the fan and quick and easy cooking) can’t wait to try it. when you say long grain rice, do you mean basmati? Bee, from my lesson on rice yesterday, I learned that rose matta is a variety of rice. It is available in Indian stores as matta rice and apparently is sold as parboiled as well as hulled without parboiling. You may also find it in the stores as Palakkadan matta rice, which means that it was grown in the Palakkad district of Kerala. Indira has a section on parboiled rose matta rice with beautiful pictures of the rice grain, uncooked as well as cooked. Mandira, so you did! Sorry about that! I do need to get my eyes tested! Tukda basmati was what we ate on a regular basis - and whole grain fragrant basmati was for pulaos and biryanis. It's only since we moved here that we eat whole grain basmati on a regular basis. And that is not very healthy. I am trying to change that but no-one besides me cared much for long grained brown rice. "You have to chew it too much!" was the main complaint. Shilpa, ok, took me a while but I figured that one out! :D I used basmati but if you read Ammini's suggestion, she says any long grain rice will do. Let me know how you liked the paal paayasam. mine. I make palpayasam with that. How about just topped with a single crescent-shaped piece of fresh ripe mango? no? ok....how about garnished with the dew that in the morning settles on the petals of fragrant white roses? Pel, from the food styling point of view, yes! But not otherwise! Dew from the petals of white roses...you are a poet, aren't you?! Gosh that was beautiful! The book is definitely very precious. It has a wonderfully simple recipe for suran (telinga potatoes) that I am very eager to try next. I really like that I haven't had to look for special ingredients in whatever I have cooked so far. And the list of ingredients in most recipes is also not overwhelming. I will check out rose matta rice here, too. wonderful explanation with photos too! !i have to get this book now. it is so very true that paal payasam does not need any flavoring of elaichi/cinnamon. one of my friends(keralite) made it for us when we visited her in phoenix and it was truly divine! Palpayasa: OMG! another divine dessert. You ladies are hell ebnt on converting me :). the grand finale, paal payasam! I was very patient with the payasam and it turned out creamy and perfect.Half cup of sugar was just right sweetness for me. I bought one gallon of milk and one quart of heavy cream (read the recipe carefully only after buying them) Now I'm thinking of giving Anita's kheer a shot later this week. 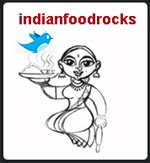 Right now, in my house, Manisha's Indian Food Rocks rocks! Lol! the paal payasam served at weddings is the most yummiest (is that even a word? )..its been long since i tried it ..will try this next week , maybe. Pel, you're the best! Thank you so much! The pictures were kind of jinxed. The first time I had great daylight but the camera was on some wrong settings and I didn't notice till we'd wiped the bowls clean. The next time, it was overcast. Sigh. It's not easy...But I'm so glad you liked them! Mallugirl, now that's a decision you won't regret! I'm hoping you will tell us the regional differences between vegetarian cuisine in the Malabar area where you come from and the Palakkad region where Ammini comes from. Richa, a hearty welcome to a voice of reason! Divine, yes! That is the word. I see you have the aebleskiver pan that I dream of every night. Must buy it soon! Musical, no! no! I am not the one trying to convert anyone to anything. ;-) This paal paayasam, though? Try it. At least once. Did you use tilapia fillets? I haven't cooked tilapia like that and it's pretty healthy when cooked that way, don't you think? Ranjani, welcome! Making superlative even more super is no problem in my eyes, when it comes to paal paayasam! Just don't tell Anita! Yes, I used tilapia filets. They break and fall apart easily on the tava but it was perfect in the oven.Healthy and delicious.Loved it. I was a bit surprised about the sugar in the payasa too. I kept looking at the half cup measure to make sure that is what I used. I found it difficult to believe that it was right for us. I went from two and half teaspoons of sugar in a small cup (not the amrica cup but indian teacup) of tea to a little less than a teaspoon in a span of six months… I gradually reduced my white sugar intake, a little at a time, week by week and the experiment seems to have worked. Now I can’t handle too sweet stuff. Slightly more sugar in something and I feel it is “matta god” like they say in Marathi! Shilpa, you go girl and make that kheer...you don't have to take sides, I promise. I've called a truce. On sugar in tea, over the past few years I have come from 1 t in the Indian cup to 1/3t in the Umreeki cup! It is so less that I think I might as well not add any. It is so easy to over-sweeten when there is hardly any to begin with! Your kheer is definitely on for this weekend. I’m also thinking of picking some more dishes from your blog and making a complete meal. Just like I did with Manisha’s recipes yesterday.The mutsch is cooing to me. So there is scope to reduce more sugar in my tea, looks like! Shilpa, tilapia is not native to the US. It was brought here from Africa and is farm-raised. When I first ate tilapia here, I was convinced it could not be the same flavorful fish we used to eat in Kenya! But it's cheap, doesn't fall apart, has next to no mercury as it is farm-raised, is rich in omega-3 and presents a viable option to cod or wild salmon, even though it is not as flavorful. I use tilapia for most of my fish curries. I tried standing at the seafood counter at the Asian market recently and I just couldn't go through with the process. So like, Pel and Anita, I too would be a vegetarian if I had to kill my own meat or fish. So instead I bought some frozen blue mackerel, not knowing what I am going to do with them! I gave up sugar in my tea a long time ago. My palate hated adjusting to the difference in the sweetness of sugar between the US and India. One day I forgot to put sugar in our tea. We drank it, liked it and never went back. I hung on to sugar in my coffee till about a year ago. No more. I'm free! Shilpa, you have the makings of an event there. I made this, this and this from this blog for one meal. At least 3 dishes. Go on then, start it! Except that I won't be able to participate. My 3 dishes are usually: rice or roti, dal or meat curry or a bhaji and a quick salad. Manisha how are you? I'm here after long. I had seen these pictures on the flickr stream and knew this post would be interesting. I don't care much for kheers but now I crave to cook it for the fun you mentioned but only once Dad is here with me again. Very clever - so, now, who is the smarter one again? Anita, you are always way way way ahead of me! I always make pal paayasam by boiling rice, sugar and milk together. To get the pink hue, first pressure cook milk in low flame the with sugar for around 30 minutes after the first whistle. After this I add rice/vermicilli and more sugar if needed. The pressure cooked milk condenses a lot and turns a deep rich pink colour. So if you wish you can add a little more milk. Rice **always** gets cooked despite the addition of sugar. I think the secret to best payasam is not to add water at all. many people i know first cook the rice/vermicilli in water then add milk and sugar which gives a totally different taste. My mom makes this in uruli with long hours of stirring and her ari payasam is the BEST I have ever eaten including ambalappuzha payasam. 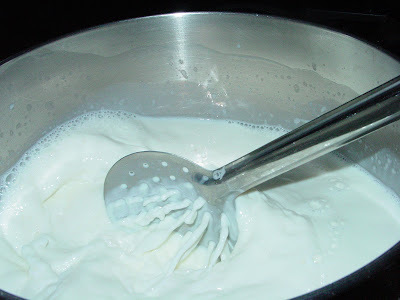 When the milk condenses, the usual taste/smell of milk goes away and as you say, it tastes good even without elaichi. I love to eat the solidified milk left at the uruli edges. that tastes even more divine than the payasam. Sreeja, welcome! And thank you so much for your detailed comment. You may have just told me how my mother used to make kheer in the pressure cooker! I have a lot of questions for you. But before that I need to add that that there were two times that I made paal paayasam according to Ammini's recipe when I did add the sugar before the rice was fully cooked and the rice did not cook beyond that point. I simmered and stirred for almost an hour each time. So I am a bit flummoxed. Do you cook the rice along with the other ingredients, under pressure? Or without the lid? Could it be that the sugar is already caramelized that it does not interfere with the cooking of the rice? What are the ingredients in ambalappuzha paayasam? I hope you'll come back to tell me more! The paal payasam looks most appetizing! Ammini's recipes are the latest craze in my kitchen. One question though - Is there any way to avoid having to remain by the stove to keep stirring the pot? Also, what do you think would happen if we used partially cooked rice instead of cooking the rice in the milk? Can you please tell me why this is done? Someone told me that cooking the rice in the milk enhances the flavour and the taste of the payasam. Please clarify.